September 28 in the Campus Center Lobby at 11:15 a.m.
Come cheer on our athletes as they embark on their fall seasons. Then stick around for a basketball competition between the athletes and members of the Greek community. Ram Nation will be there too, playing the music you want to hear. Bring a backpack to take home a variety of giveaway goodies. 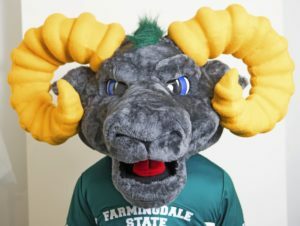 And, of course, FSC’s mascot, Ram-bo, will be there too. So start getting psyched for one of the biggest events of the fall semester. Please print and post this flyer: Fall Pep Rally.